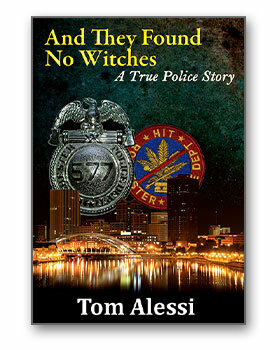 Told in Tom Alessi’s own words, And They Found No Witches recounts the remarkable true story of corruption, honor and bravery among police officers. As one of five police officers arrested and tried in Federal court, Tom has spent over twenty years compiling the details and writing the story of a case that rocked Rochester, NY, and forever changed lives. Written in a style that is as riveting as the case itself was, And They Found No Witches offeres a rare first-hand insight into our law enforcement and judicial systems. Tom has shared video, photographs and news clippings, some of which were not available in the book. Click here to see them. please email him for more information. Written permission from Thomas W. Alessi.